Have you heard of the new collection at Target for the younger, bolder, and on trend woman? Available in plus sizes, Wild Fable is one to watch and shop! Target is not here to play with y’all, with their newest collection, Wild Fable. Um… Have you had a chance to feast your eyes on the new Wild Fable at Target collection? If you’re looking for delightful, nostalgic looks for your Fall, you’ve come to the right place. Wild Fable is giving us a 90’s Clueless feel with a modern fit and flare. The line includes cute dresses and skirts, jogger sets, jumpsuits and stylish jackets for work or for play. And did we mention that most of the looks from Wild Fable at Target come in plus sizes? Up to a 4X? 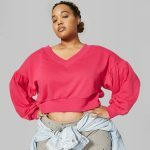 Target is making it clear that they are here to come for the fast fashion, edgy, contemporary, and affordable fashion brands with this new addition of Wild Fable. And? It is really cute. Wild Fable is a collection of young women’s apparel, accessories and shoes are meant “to mix, match and make your own, all for less than $40 per piece.” With a ton of casual-chic basics to mix and match with any style, Wild Fable is a must-have for the bold, thrifty, yet fashionable girl. Prices start at $3 for a basic tank and nothing is over $40! Ohhh and did we mention that the collection is available up to a size 28W/30W! 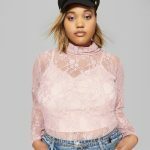 As Target is on a mission to bring more plus size fashion in store, we do hope that they do not leave this collection out of the mix! See why we are geeked? Too many cute things, right? I mean, who doesn’t love a good set? 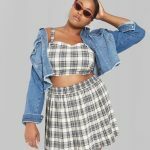 Well the adorable plaid crop top and skort set will make your end of summer dreams of true Yes, a skort! We literally feel like we’re in junior high again. And then… Our hearts are aflutter for that sheer mesh dress. Paired with a cute cami, t-shirt or even a fancy bra, and you’re good to go. They have a ton of rompers and jumpsuits, which are perfect transition pieces for the fall. Just add a denim jacket or a cardigan for extra coverage. And girl… the throwback windbreakers? We are here for this! Visit Target.com to check out everything Wild Fable! Or just head to your nearest Target and try not to spend the rent money. The best part about this colection at Target is the accessibility of these items, which are usually very hard to find for extended sizes, especially in-store. 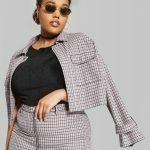 We’re excited to see more stylish, comfortable items being continuously added at Target and their efforts for plus size inclusion. And with these prices, you literally can’t resist. Which pieces are you in love with?